In case you missed the signs, it’s the Holiday season. You might travel to foreign and exotic, or less far-away places. Especially during this period of splurging on food, drinks and candy, it’s important to keep practicing yoga, whether it’s at home, in your hotel, at your host’s house or at a local yoga studio. Your body and mind need regular practice in order to stay flexible and healthy. As you may know, practicing yoga helps your digestive system to function optimally which is extra handy during the festive period of heavy and not necessarily healthy (over) eating. If you prefer to do your yoga practice at home, please read my post on starting a Home Practice. 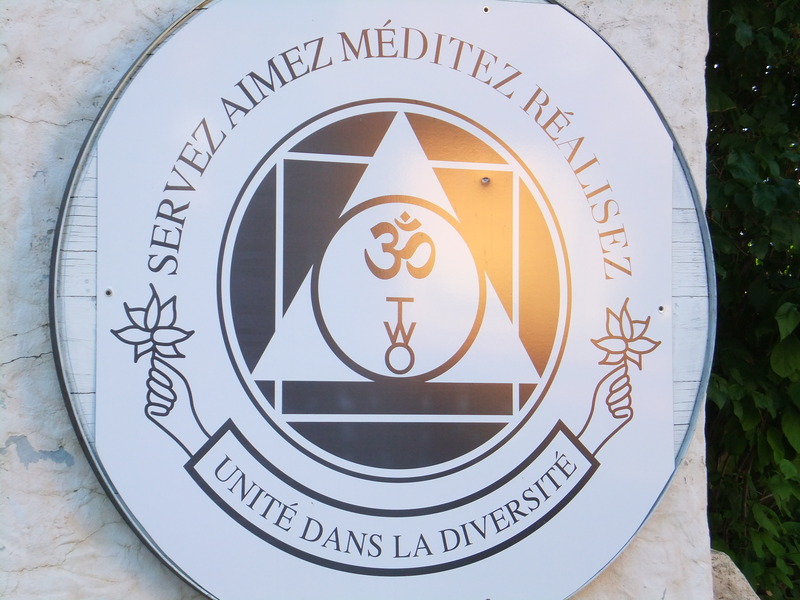 Sivananda Yoga Center: the Center is located near the Gare de l’Est and you can practice yoga every day of the week, with special classes for seniors as well as for pregnant ladies. Join one of the many workshops for beginners or more advanced students, featuring teachers from around the globe. You can also catch a satsang (chanting & meditation) if you are lucky. On Saturday there’s a trial class for beginners. Sivananda Yoga Center: located near Putney bridge in a lovely residential area. As in the Paris’ center, you can join a regular class or a workshop (registration only), as well as join a retreat in the countryside or take a certification course or even your Teacher’s Training course. The center has a kitchen and offers regular opportunities to eat lunch or dinner (reserve when you book your class), the food is very good, vegetarian (sattvic) and there are always vegan options (inquire). On Saturday there’s a trial class for beginners. Sivananda Yoga Center: in the Rome center which is located a bit outside of the city center (accessible by bus 61), it’s in an apartment building so easy to miss 🙂 I took a class in Italian (w/o speaking the language) and it was lovely. There’s an English spoken class on Saturdays and a special class for back care on Thursdays. Yoga Community (Sivananda): In Amsterdam there is an affiliated Sivananda yoga center, with regular classes and workshops and even satsangs. It’s located in the city center and easily accessible by public transport.There are several classes per week, check their blog for more information. Sivananda Yoga Center: This was the first center in Canada founded by Swami Vishnu-Devananda. It’s a lovely place on Boulevard Saint Laurent. There are daily classes in French/ English. Workshops and satsangs are organized and it’s the meeting point to take the shuttle to the Ashram in Val Morin, about 1 hour drive, on Fridays. You might be lucky and enjoy a meal there too, inquire. On Sunday there’s a free trial class for beginners. Sivananda Yoga Center: This center is very small, but nice nonetheless. It’s located on Harbord street near Spadina avenue, easily accessible by public transport. There are daily classes, regular satsangs and even puja ceremonies. On Sunday there’s a free trial class for beginners. Octopus Garden Holistic Center: This yoga studio in Toronto on College street offers a free trial week to try out many different classes. There are different types of classes, teachers and several yoga shalas (rooms), it features a vegan café and small shop for yoga articles. What I loved about the place was there is a no-scent policy, so people are kindly requested not to spray deodorant or perfume in the changing rooms. The class I joined was Vinyasa flow, and quite intense, the teacher walked around a bit helping students out, making jokes. The relaxation at the end was too short, but it was a nice discovery. The yoga room is bright and spacious. The vegan café was amazing. I had a delicious salad and smoothie and muffin. Excellent combination of yoga and food for the soul. A couple of years ago, I went to a small studio in the Castro district, probably on 17th street, near Diamond Street (but I don’t remember exactly…). The yoga style was hatha or Iyengar and the lovely, male, teacher made us use props. The vibe in the studio was great, very zen like, there was free herbal tea after the class and it was a very small group. I went to the 8 AM class, a great way to start your day, with early morning yoga, even when on holidays. Afterwards I had brunch at Samovar tea lounge on 18th & Sanchez street, a delightful place with lots of amazing teas and vegan choices of food. The quinoa waffles were delicious! I’ve been to 2 of the Sivananda ashrams and they are both magical places to recharge your batteries and disconnect completely from the stress and noise from the city. Orléans, France: located in the middle of nowhere, as it should be, about 30 minutes by car from Les Aubrais-Orléans SNCF station, it’snot easily accessible by public transport however and taxis are expensive. It’s best to try and arrange a pick up by the ashram when booking or drive there (carpooling with blablacar). The place itself has a chateau, the main building where there is the dining hall and a smaller yoga room, as well as the offices, several private, double and shared rooms and the shop. There is the meditation hall, which has some rooms on the ground floor, the kitchen building, a camp site, a temple and several cottages (shared rooms). It’s very silent and pretty, with well maintained gardens and great lectures, classes, silent walks and food. Val Morin, Québec, Canada : this is the ashram that Swami Vishnu-Devananda started after swami Sivananda had sent him to the West to teach Westerners yoga. The ashram is located in Val Morin, about an hour drive from Montreal in the Laurentians, it’s a beautiful and huge place with several buildings: a main building, a temple, several dormitories, a main meditation and yoga hall, the Peace Plane museum, camping areas, a swimming pool, swamiji’s house, a kid’s camp, … There’s also the Aayapa temple higher up on the hill. The place is so peaceful, green and silent that you’ll have a hard time leaving. There are two daily classes, meals and satsangs, yearly Teacher’s Training Courses, certification workshops, and much more. As with all centers and ashrams, it’s being managed and led by volunteers (swamis, staff and karma yogis). Try to go at least for a long weekend, but if you can, stay as long as possible to soak up the peaceful vibrations and life lessons of living in an ashram. Make sure to come once for the Kavaadi festival in July, it’s a true spiritual experience when thousands of Indians flock to the ashram’s temple for the celebrations of lord Subramanya. Read more about all the other Sivananda ashrams and centers worldwide. If you want to try out yoga someplace else, there’s a great source for finding a yoga teacher, studio or event nearby, which is YogaTrail, or finding classes nearby, on YogaFinder. Hopefully this post inspires you to go to a local yoga center whenever you are on holidays or a business trip. I’m looking forward to reading your tips and favorite places to practice yoga. May peace, love & light be on your path. Om Shanti, shanti, shanti, …. Categories: Sivananda, Yoga classes, Yoga info | Tags: holiday, Sivananda, yoga class | Permalink.